While discussing bishop John Shelby Spong’s book, “The Fourth Gospel: Tales of a Jewish Mystic” (which I enthusiastically recommend reading) the question arose as to whether we might understand the Holy Ghost as the Second Coming? I think the answer depends upon how one understands the terms, and the ideas toward which the terms point. Chapter 19 of Spong’s “The Fourth Gospel” relates the allegories of the “vine” to an understanding of God as an in-dwelling Spirit; this is specifically in opposition to thinking of God as external to us. Spong is speaking of the in-dwelling Spirit of God as comprising part of who we are as self-conscious human beings. It is not that God is absent in animals, and even rocks. But we do differ from rocks and even birds and cats and dogs, in that we have a very strong sense of self-awareness and self-consciousness. This is why we struggle against the idea of death. Dogs and cats and cattle may struggle against death itself, but they do not sit around worrying about the eventually. We do; because we are self-consciousness. We know that we exist, and we know that we will cease to exist. The effort to transcend this eventuality is the reason many of us search for God. Pantheism basically means “God Everywhere.” God is understood as being everywhere in the cosmos: in every rock, every tree, every stream, every bird, every dog and cat, and in every person. This is one of the ways animalism and many aboriginal religions are interpreted by persons living in the West, although typically with the arrogant caveat such a “primitive” notion must be mistaken. The “small” way of viewing pantheism is as lots of little spirits dwelling within everything: wood sprites, water spirits, etc. Every culture of which I am aware, from the dawn of history, developed such a view. Greco-Roman paganism was similarly structured, ranging from the “Big Gods” on Mount Olympia to city gods, to family gods, to gods of brooks, streams, woods, etc. There were gods everywhere, and they were vested in every part of leading one’s life. Most forms of Christianity, I suggest, see this as a form of multiple (“false”) gods. But there is an important point to add here, which I find adds perspective. Christians tend to be concerned about their afterlife: Heaven or Hell, as the saying goes. Pagans were not especially interested in this. Most of them assumed death brought our annihilation. What did matter for them was this life and getting enough to eat, having enough water to drink and raise crops, remaining healthy, and related basic needs of our survival. Also, death was ever-present in a way I feel we fail to appreciate. Where we get an abscessed tooth, and go to the dentist, they usually died! The world was very different 2,000-years ago, and this is a significant point we tend to forget or fully appreciate; many of us (most?) certainly fail to feel that kind of reality in our own day-to-day lives. So I suspect we tend to ridicule “pagans” and those who hold aboriginal beliefs largely out of our own ignorance. Where is God not found in nature? This requires some thought regarding the nature of God. Is God only a personality? Or is God the vital force of life itself? Does God have a face and lungs, or is God the very essence of life? Stated poetically, we ask if God is the Breath of Life? Stated more abstractly, the 20th century theologian Paul Tillich suggested that we consider God as our Ground of Being. If God is the essence of Life, then we have to find some way of imagining God within everything: rocks, dust, bugs, deer, sharks, cattle, dogs, cats, and ourselves. I would suggest this way of seeing God is very close to the truth; and would result, if taken seriously, in better treatment of all the creatures and resources of this world; as well as one another. An alternate view, is seeing God as a Big Person Above the Sky. Useful in terms of language and metaphor, to be sure. But if we take this too literally, how does this significantly differ from Zeus-Jupiter? The late Prof. Ron Miller of blessed memory, suggested it is instructive to think of God as panentheistic. Pan*EN*theism (adding the “en” between pan- and -theism) argues God is everywhere, both within the cosmos, and outside the cosmos. The key point of this idea is that God is not limited to the confines of this universe (cosmos). Of course, we cannot really wrap our minds around what this means. Our language cannot adequately describe what this implies. We are creatures of time and of space. And our language reflects, and is limited by, our nature as beings of time-space. How does one envision a Being which is not constrained by the very limits of the universe itself? This is a really, really BIG God! I believe this way of thinking about God has to be tied to Paul Tillich’s “Ground of Being” idea. For me, this represents God as the very vitality of life itself. As advanced as our medical science is today, we do not understand the *essence which creates life. We, for example, know that brain trauma may become debilitating, but we also know the brain sometimes compensates by building new neural pathways. And doctors have not found our spirit, or even our consciousness, inside the brain. Some disagree, and equate behavior changes as the result of brain trauma as proof of our seat of consciousness residing within the brain. I disagree. I think this only demonstrates that the “radio” has been damaged, and no longer receives the “radio waves” properly. In this analogy the brain is the radio, and the radio waves represent our spirit, our consciousness. And I submit that our consciousness, or spirit, is our seat of being. But from what does our spirit, or being, emanate? Tillich suggests this flows from the Ground of Being: God. In this way of seeing God, God is the fabric, the very essence, of the universe; God is what holds the subatomic particles together; God is space-time, onto/into which everything else resides. God is all that, as well as that which is beyond the knowable universe. If one believes this is likely to be true, then “God” is best understood as panentheistic. And even though we cannot completely wrap our heads around this, we can sense this is a very, very BIG idea of what must comprise the very nature of the “Beingness” (ontology) of God. Now, as Christians, we have to figure out what to do with Jesus and the Holy Spirit. In the early days of the Jewish-Christian “Jesus Movement” there was only One God. And not God-three-is-one, as the doctrine of the Trinity came to propose in the 4th century. Some early Christians believed Jesus was entirely human and unable to be God. Others thought Jesus was God and unable to really be human (he just appeared so). Others thought Jesus was a divine being of the highest order (above angels for example) but a creature created by the Uncreated God (this view presupposes there are only two categories of existence: the Uncreated; and that which is created: “creatures”). All of these ideas were early Christian teachings. And they all had sacred books, thus proving their point! Why books are so important to the Christian traditions is an interesting question. In part, it is because Christianity evolved from Judaism, and the earliest Christians needed to be thought of as already “ancient” and therefore just another way of understanding the very ancient Jewish religion. In part, it is because completely unlike pagan religions, Christianity is very concerned with what a person believes; pagans, in contrast did not care what a person believed, only in what actions they took – namely, offering the proper sacrifices and prayers to the gods, so as to sustain our life in the here and now. All of these ways of “properly” understanding what it meant to be a Christian were being debated in the first 300 years after the execution of Jesus. In the orthodox Christian tradition, these matters came to be codified in the Council of Nicene, convened in 325 ce. It is from this council that we inherit the Nicene Creed. While this council did not settle the debates entirely, they did resolve the larger issues, and framed the limits of theological debate to the present day. But they lived in a three-tiered universe: Heaven Above; Earth; and Land of the Dead Below. We no longer live in that three-tiered universe/cosmos. Therefore, we have to re-think their basic arguments and assumptions, if we wish to carefully think through questions such as the nature of the Second Coming and the Holy Spirit. And we really have to re-think these kinds of questions if we are going to try to understand the Gospel of John on its own (mystical!) merits. I find I agree with bishop Spong’s proposition: the Gospel of John was written by Jewish-Christian mystics. These authors were not speaking of God as residing Above the Heavens. They were speaking of an In-Dwelling God, an understanding of God as dwelling within each of us. This is a very different understanding of God, even today, nearly 2,000-years later! But what if “God” is within each of us and “wants” us to live in such a manner as to expand life for ourselves and everyone around us? What if God is the very expansion of the universe and the force of life that constantly seeks expression? What if this self-expression of the essence of God is vitally present in self-conscious beings, such as human beings? God is present in everything, but we are aware of this in-dwelling Presence! This is a very different understanding of “God” and for many it doesn’t seem easy to grasp. I am not a strong trinitarian. In the many hundreds of years since formulating the conceptualization of God as the Trinity of Father-Son-Spirit, no one has nailed this down! The best theologians of the last 1,700-years or so have always said the heart of this is a “mystery.” In other words, no one understands it! 5. The Son is not the Holy Spirit. 6. The Holy Spirit is not the Father. 7. There is only one God. 4. Zeus is not Apollo. 5. Apollo is not Poseidon. 6. Poseidon is not Zeus. 7. There are three Gods. Here we have the same formulation, one from a Christian perspective, and one from the Greco-Roman perspective. They are identical in the logic of the first six steps. However, the final conclusions are in direct opposition to one another! This illustrates why Christianity was so perplexing to pagans 2,000-years ago. And it demonstrates “why the doctrine of the Trinity is so difficult, interesting and strange” (Cary: “The Logic of Trinitarian Doctrine”). Some have said, when speaking of the Trinity, we forget how to count: God is above/before numbers. Others say that God is three Persons (I prefer to say, Personae) but with a single Will. But no matter how we try to explain the idea of the Trinity, it seems strange and remains beyond our grasp. And so it has for some 1,700-years, for even the best and brightest theologians over the centuries. So if this does not really make perfect sense to you, you are in good company! If, and when, one finds speaking of God-as-Trinity useful, I say go for it! Where it is not useful, I suggest, speaking in different terms. 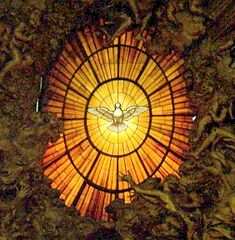 When I speak of the Holy Spirit (or Holy Ghost, which is the transliteration we get from German scholarship on the Holy Spirit/Geist) I mean the active Spirit of the Divine, of which we are aware, and with which we seek to interact. Our Christian history has offered this idea to us as the Holy Spirit, so I frequently use the same name-title. 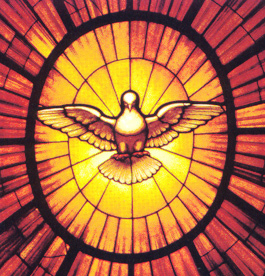 “Holy Spirit” and “Holy Ghost” are two different names for the same thing: Holy Spirit is translated from the Latin, Spiritus Sanctus; from German as, heiligen Geist; both of which are translated from the original Greek, άγιο πνεύμα, which is roughly “agio pneuma“. From this perspective the “Holy Spirit” is what I sometimes call the “Active Agent” of God in the world. I think of this as the aspect of the Divine with which we have interaction. If one is able to go along with this interpretation, then I think we are getting close to being able to see the Holy Spirit as the Second Coming. But we still have some more ideas to explore. I view both the Holy Spirit and the Second Coming as related to Transformational Christianity. By this I mean the emphasis to first transform ourselves, and through and as a result of our personal changes -a transformation in our thinking, speech, and behaviour- to transform the community in which we live. I believe this is how we observe the Holy Spirit as being active in our lives, and in our community. As we think, speak, and act better toward one another, I propose calling this change in our personal formulation, the Holy Spirit as active in our lives. Some have also called this Putting on the Mind of Christ. In this view, we understand the primary function of the Holy Spirit as that which transforms these elements (thinking, speech, and behaviour) in us, and through us, into our wider community. Thus, the Holy Spirit is that aspect of the Divine which initiates significant changes in our lives; It is the aspect of the Trinity with which we interact in this physical world. But what of Jesus? What about the Christ? This is a closely related, but somewhat different question. Here we must address the question of Christology, which is the effort to understand and make sense of the role of Jesus and the Christ, both in the early Jewish-Christian church, and in our own day and age. This is a very deep subject, asking the very nature of Jesus the Christ! Entire books have been written on this topic, and there is yet more to say. This is obviously not a question which may be adequately addressed in one essay. Christ is the Greek word for messiah, which in Hebrew is mashiach. It means “anointed” or “the one anointed” and was a ritual anointing which identified the king of Israel as chosen of God, or as the son of God. When the Babylonians wiped out the line of David, this began to symbolize something more than the kingship; the idea of the messiah began to be associated with ideas of freedom and liberation from foreign powers. God’s messiah would come in glory and overthrow the foreign rulers, and put the son of King David back on the throne. In the synoptic gospels ―Mark, Matthew, and Luke― we find Jesus hesitant to speak of himself as the messiah. I think this is because Jesus did not embrace the popular understanding of what this meant to his fellow Jews: one coming in power to overthrown the Romans. This concern is not shared in the Gospel of John, however. But we also cannot read the Gospel of John as remotely literal. To do so, is to miss the point entirely! What I think I may say about Jesus and the Christ, in just a few words, is that the way in which Jesus is interpreted in the Gospel of John, expressed as a work of Jewish-Christian mysticism, is that Jesus is the embodiment of the Life of God flowing into the world. Jesus as the way, the truth, and the life, does not mean we “believe Jesus is God.” And it is certainly not saying that Jesus has to be killed to save us! This is the core meaning of Jesus as understood in the Gospel of John. Jesus lived a life which brought the vitality of God’s Spirit into this world, and we may do the same thing. God is not “out there” somewhere, but rather God is “in here” ― dwelling within us. The way to get more God into the world, is to allow more God to flow within us, and through us, into the world: exactly as it did in, and through, Jesus. And that ―I believe― is what the mystical Gospel of John is trying to relate to us as the Second Coming. So, may we think of the Holy Spirit as the Second Coming? Yes, I think we may. In the same way, the Kingdom (or Realm) of God is always at hand. But we are required to participate in bringing it into existence. God is not going to just drop the Kingdom of Heaven upon us, crushing the wicked and rewarding the good. That was the thought behind apocalypticism, which was very popular in the time of Jesus (both roughly 100-years before and after his execution). This was the idea that God would come in glory, displace the evil (Romans) and install the City of God in his Heavenly Realm on Earth. And all would be ruled in peace for 1,000 years. But that did not happen. 2,000-years have passed, and despite that some argue “soon” means aeons may pass, that is clearly not what the people of Jesus’ time meant. They meant really soon, as in their own lifetimes soon. If we choose to read “soon” to mean thousands and thousands of years later, we are not reading the books as they were written to be understood in their own day and age. And the writers of the mystical Gospel of John were aware of this! Nearly 70-years had already passed, and a lot of people had given up on the apocalyptic understanding of “soon.” So they searched for a new interpretation, one they viewed as replacing what they now understood to have been a mistaken interpretation. And this leads to the mystical understanding of Jesus’ life and the way God seemed to be expressed in the life of Jesus. This is why we get the “I am” saying, which very clearly means Jesus is God the Father. But so too, as Jesus is in God, we are in Jesus, and Jesus is in us. We all are able to embody God the Father! This is the very radical change that John is bringing to our understanding, not only of Jesus, but of God the Father; meaning the Uncreated, which brought all that is, into being; that same vital essence is available to us, and may flow within us, and through us, and through us into the world! John is a wonderful gospel! Wonder-filled Good News! From within the Christian New Testament, it offers the most transformative way of understanding Jesus and God. Yes, we may think of the Holy Spirit as the in-dwelling transformative Breath of Life, which brings about the Second Coming, and creates the Realm of Heaven on earth. But our participation in this transformative experience is required! “The Fourth Gospel: Tales of a Jewish Mystic” (HarperCollins Publishers, 2013) John Shelby Spong.